University Village near the heart of campus. Rates are set for 2019!!! Rent starts as low as $485/month for shared bedrooms in our 2b2b and $739/month for private bedrooms in our 2b2b! University Village has some exciting news!! We are now offering FOUR bedroom units, rates start at $619/month for private bedrooms! 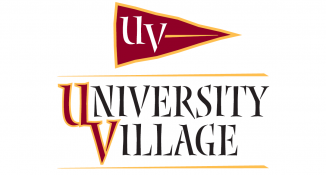 University Village offers spacious apartments, averaging 1100+ square feet. Additionally, UV offers roommate matching and UNLIMITED utilities! We also have a number of amenities for the residents to take advantage of, included in rent!